FILE - Sen. Bob Corker, R-Tenn., right, with Sen. Lindsey Graham, R-S.C., speaks at a news conference, Sept. 14, 2017, on Capitol Hill in Washington. Key U.S. senators said Tuesday there was overwhelming evidence that Saudi Crown Prince Mohammed bin Salman was behind the killing of a dissident Saudi journalist inside Riyadh's consulate in Istanbul, rejecting President Donald Trump's claim that the case against him wasn't convincing. "If the crown prince went in front of a jury, he'd be convicted (of murder) in 30 minutes," Senator Bob Corker, the Republican chairman of the Senate Foreign Relations Committee, told reporters after hearing Central Intelligence Agency director Gina Haspel describe evidence U.S. investigators had compiled in the killing and dismembering of Jamal Khashoggi on Oct. 2. Corker said "it would be very easy for the president to step out" and say the crown prince "killed a journalist." Instead, Corker said, Trump "says it's OK to do it." FILE - CIA Director Gina Haspel testifies before the Senate Intelligence Committee on Capitol Hill in Washington, May 9, 2018. Another prominent Republican lawmaker, Senator Lindsey Graham of South Carolina, said, "There's not a smoking gun, there's a smoking saw," referring to Saudi agents who used saws to cut up the body of the 59-year-old Khashoggi. The journalist lived in the U.S. and wrote opinion articles for The Washington Post that were critical of the crown prince and Riyadh's involvement in the years-long war in Yemen. He had gone to the consulate to get documents he needed to marry his Turkish fiancee. Graham called the crown prince "crazy," declaring, "Business as usual (on long-running U.S. aid to Saudi Arabia) has come to an end for me." Graham said he went into the briefing with Haspel "believing it was virtually impossible" for the Khashoggi killing to be carried out without the crown prince's knowledge. He left the briefing with "high confidence" that his assessment is "correct." A man holds a poster showing images of Saudi Crown Prince Muhammed bin Salman (L), dubbed "assassin," and of journalist writer Jamal Khashoggi, dubbed "martyr," during a prayer service for Khashoggi, in Istanbul, Turkey, Nov. 16, 2018. 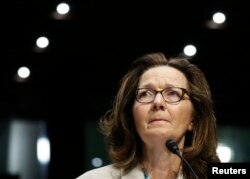 Haspel's briefing took place after the CIA was excluded last week when Secretary of State Mike Pompeo and Defense Secretary Jim Mattis spoke with senators about the journalist's killing. They supported Trump's claim of uncertainty in responsibility for the killing. Trump last month voiced continued support for Saudi Arabia, the world's biggest oil exporter and an ally of the U.S. in containing Iranian aggression in the Middle East. Trump condemned the Khashoggi killing and said "it could very well be that the crown prince had knowledge of this tragic event." But Trump equivocated on whether the crown prince's ordered the killing, saying, "Maybe he did and maybe he didn't!" Whatever the case, the U.S. leader said American business deals with Riyadh and U.S.-Saudi military cooperation in confronting Iran outweighed condemnation of the crown prince's links to the Khashoggi killing. Riyadh has indicted 11 operatives in the killing, seeking the death penalty for five of them. The U.S. has sanctioned 17 Saudis for their alleged involvement in the Khashoggi killing, meaning they can't enter the U.S. and any assets they have in the U.S. are frozen. U.S. lawmakers are now debating whether to cut off arms sales to Saudi Arabia, which Trump claims could total $110 billion in the coming years, and whether to end aid to Riyadh for the Yemen conflict. Last month, when Trump expressed his ongoing support for Saudi Arabia, he said he understood that some lawmakers might disagree with his assessment of whether the crown prince was involved in the Khashoggi killing and might want to sanction Riyadh. "I will consider whatever ideas are presented to me," Trump said, "but only if they are consistent with the absolute security and safety of America."